With a national reputation for excellence, the School of Law-Camden is noted for its diverse student body and distinguished faculty. Drawing from almost every state across the nation and from several foreign countries, about 750 students at the law school interact daily with people from all walks of life. Each year, approximately 200 students who have achieved academic excellence join the entering class. These students typically come from more than 140 undergraduate institutions, including Boston College, Colby, Columbia, Cornell, Dartmouth, Emory, Florida State, Georgetown, Michigan, Notre Dame, Penn State, UCLA, USC, Texas, Tufts, Yale, and of course, Rutgers. Students at the law school also enjoy a dynamic educational experience. The law school faculty is known for its scholarship and commitment to teaching. Recognized nationally and internationally in fields as diverse as state constitutional law, health law, professional responsibility, and legal history, the faculty incorporates interdisciplinary and innovative approaches into much of the curriculum to balance traditional legal learning with practical application. In addition to its mission of research and writing, the faculty is dedicated to community service and to the bar. Students are encouraged to work with faculty in clinical programs and pro bono public interest cases. Students also have the opportunity to interact with practicing lawyers, judges, and governmental agencies through internships, clerkships, and clinical programs. 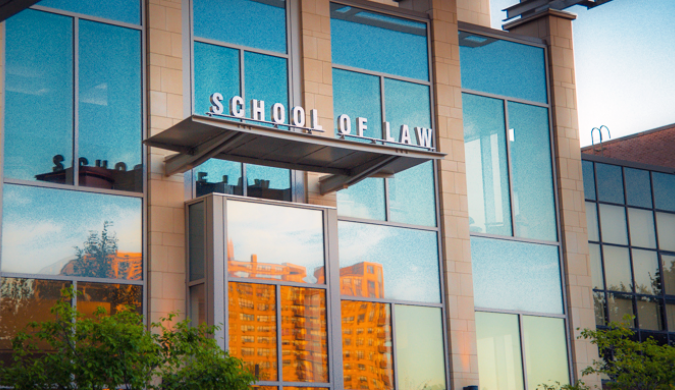 If going to law school gives you the jitters, your fears will quickly be assuaged at Rutgers, The State University of New Jersey—Camden School of Law. Sure, just like other prestigious JD programs, Rutgers will treat you to a dose of the “Socratic thunderstorm approach,” and there is the typical “never-ending workload” throughout the first year. However, Rutgers maintains a remarkably friendly and supportive academic environment. Students insist, “First-year classes don’t intimidate you, as there’s no fear of speaking your mind in class, and diversity in thinking is highly encouraged.” Outside the classroom, Rutgers professors are personable, to say the least: “Every Wednesday afternoon, there’s a veritable party in our torts professor’s office during his office hours. So many students go to discuss both academic and non-textbook-related topics that there aren’t enough chairs and people sit on the floor,” recalls one 2L. In fact, “It’s common for professors to take students out to lunch, to conferences, and even to show up at student-sponsored pub crawls.” The administration draws similar praise from students, who believe it “tries to be very open-door and available for anything we could possibly need.” A 1L jokes, “I came to Rutgers expecting to witness students getting ‘burned’ by professors every day in class. Instead the only burn I got was on the roof of my mouth while eating pizza with the dean.” Students are impressed with the caliber of the Rutgers faculty, describing them as “knowledgeable and passionate about their subjects” and able pedagogues to boot. In the lecture hall, “The faculty is as intelligent as they are witty. Anecdotes from [their] real-world experiences are common in the classroom and make some of the drudgery more interesting.” Many also point out the strength of the adjunct staff, who “come from varied fields, providing a unique and practical perspective to current topics.” Indeed, a practical approach is emphasized at Rutgers, and classes may even include “spontaneous fieldtrips to the federal courthouse across the street from the campus just so we can view real-world motions to dismiss, jury selection, and final arguments.” The school’s active alumni net­work is also called on to contribute to the JD experience, and students tell us that “in many courses, alumni return to give lectures on the practical aspects of the subject, and they have been willing to assist any student [who] has a question.”Among the greatest perks of Rutgers—Camden is its low tuition, offering a “fantastic and highly respected education at a very reasonable price.” As a result, students do not experience the financial anxiety common to law students today. “Due to a scholarship and a summer internship at a Philadelphia law firm,” reports one 2L, “I will graduate with a top-rate legal education and virtually no debt. That combination is hard to beat, and I expect it will free up my career options considerably.” The school takes advantage of the resources in the surrounding community to instruct students in the playing out of law in the real world. “The federal courthouse is literally around the corner, the county courthouse a couple of blocks [away],” and Rutgers stu­dents “have tremendous access to the judges in the area and several teach as adjuncts.” Students also praise the fact that “the law school is very involved in the community through its pro bono clinics.” Rutgers is “located close to Philly, Trenton, and New York, so there are plenty of job opportunities.” On that note, “Career Services are always on the job helping students get placed for both summer and permanent positions. They also expose students to the dif­ferent options available to attorneys by having guests come to the law school to provide experiences in different areas.” Rutgers is somewhat unique among law schools in that almost half of the graduating class takes judicial clerkship positions, more students than those who take positions in private practice. JD/MBA,4years; JD/MPA-Public Administration,4years; JD/MSW-Social Work, 4years; JD/MS-Public Policy, 3 1/2 years; JD/MCRP-City and Regional Planning, 4years; JD/MD and JD/DO - University of Medicine and Dentistry of New Jersey; and JD/MPA-Public Administration in Health Care Management and Policy 4 years. Want more info about Rutgers the State University of New Jersey School of Law Camden? Get free advice from education experts and Noodle community members. What's the probability of being accepted into this law program with a GPA of 3.28 and a 155 LSAT score?